The Spanish word "matanza" means killing or slaughter. I knew upon arrival to this place that it's fearsome name was just for show. It was meant to instill fear in the hearts of evil doers of old. Today, it is merely a word. All of the ugliness of it has been replaced with a completely different vibe. The Good Year Blimp is alive and well! I'm sure the neighbors LOVE him! The tide line. You know we're nearing an inlet! Our trip from Daytona Beach was uneventful. We left before 8 am to make a bridge opening, and we even had some favorable current of much of the way. We hoped to arrive and get safely anchored before the afternoon Thunder Boomers set up... and we just made it. We took our time in picking just the right spot. We explored the depths all around, lucky that there were no other boats anchored here to contend with. We finally picked our perfect spot in about 8-9 ft. at low tide, very near the old fort. We would tour the fort tomorrow, but it had been a hot day and we were ready to swim. There were mean looking jellyfish speeding by on the current, so even though the water was blue green and inviting, we chose not to swim off the transom and so, hopped into the dinghy to find a nice empty sandbar to swim on. There were some people around when we arrived in the anchorage, but they all disappeared shortly after 5 pm. I think I could like this "having the world to ourselves" after all. 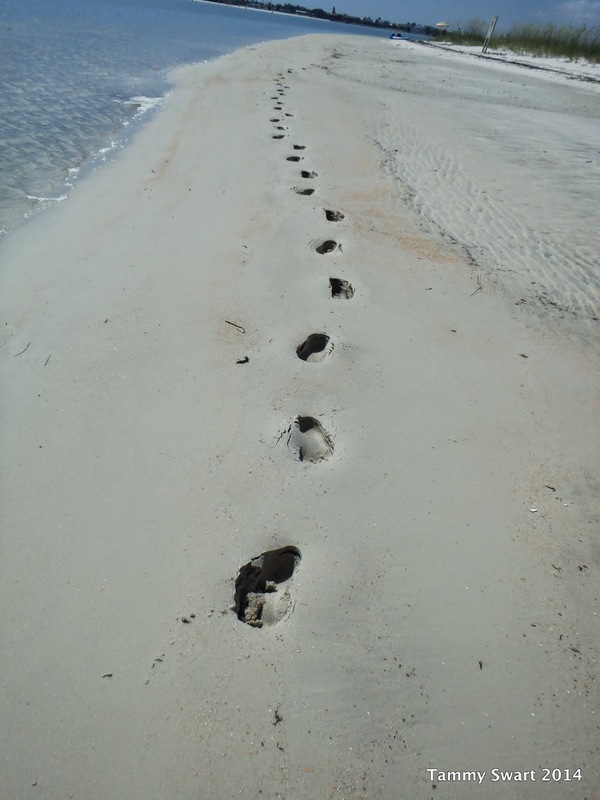 I explored the shallow water of the sandbar. The sands were shifty in spots and it felt strange beneath my feet. Bruce got a little swim in. It was funny to watch him try to swim upstream. He could just barely swim faster than the current so he made slow if any headway. Everyone has gone! We have the place to ourselves! We cooled off in the shallow waters as long as we dared before making a dash back to the boat - as usual - to batten down the hatches and prepare for the blow. This time it would be just a gentle rain with hardly enough wind to ruffle the water. Those are the kind of storms we like... The kind that barely brush us as they pass us by. The menhaden ruffled the water's surface in a feeding frenzy! We slept like babies in the silent anchorage. 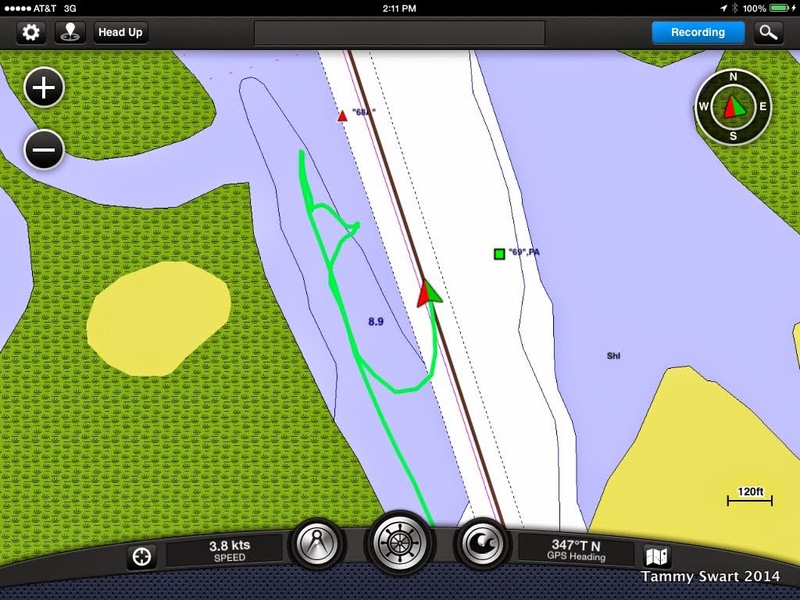 Even with the swift reversing current, we've stopped being so worried about our anchor dragging. Bruce still gets up in the night to check things out but I can sleep soundly. We were all up early with thoughts of going fishing. They're just thoughts however. The action we saw here last night was gone. I think they were menhaden flipping and flopping at the surface of the water. But they sure had Bruce fired up. They must all be sleeping this morning. We would visit Fort Matanzas National Monument today. There is a free tour that leaves from the opposite bank, so we dinghied over to catch the ferry to the official Fort landing. I felt a little bit proprietary as we had basically had the Fort to ourselves all evening. Yet, we piled aboard the packed ferry, the first of the morning, with other tourists hoping to see this pile of rocks before the day grew too warm. Our Park Ranger, Jill, did a great job of making the days of fighting the enemy with cannon fire come alive for us. 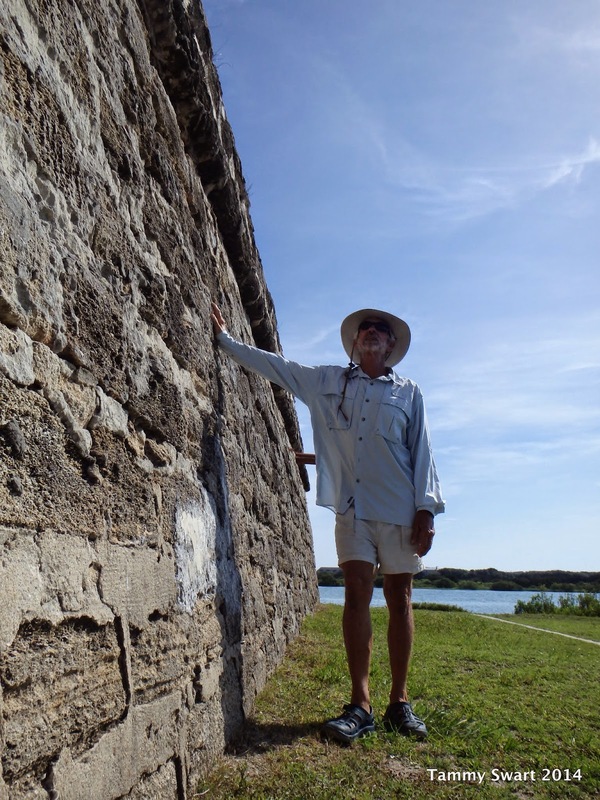 One of the more fascinating aspects to me, being a lover of all things stone... is learning about the Coquina, of which this fort and a few others, are made. It is a sediment of sand and shells that is quarried and cut into blocks, then allowed to harden. 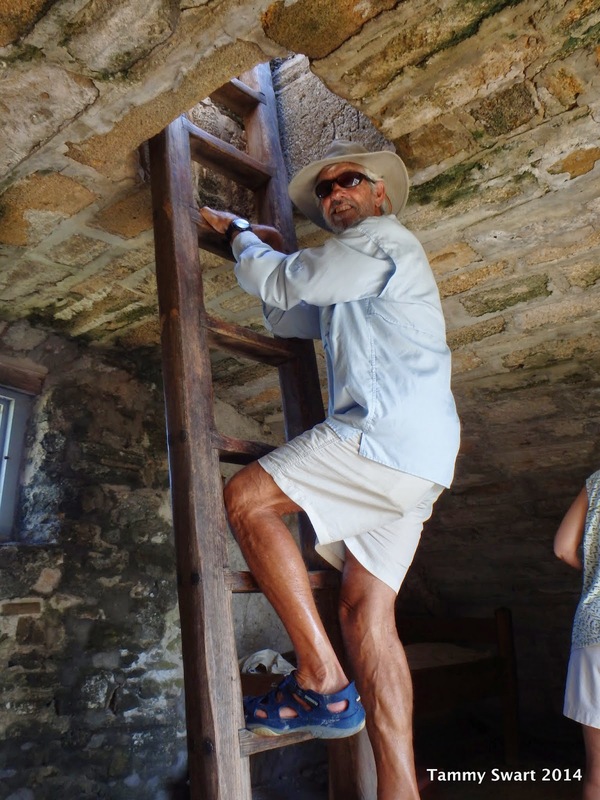 It has been mined from Anastasia Island and used in Florida for over 400 years to build this fort and others in and around the St. Augustine area. The characteristic that Coquina posses which makes it so useful in the building of Forts of this period, is it's porousness. The builders of the era in which these forts were raised discovered that when a cannonball was fired at walls made of Coquina, instead of shattering, they would just absorb the impact. It was likened to sticking a knife into a block of cheese. When the enemy discovered that their cannon fire was useless against the fort, they eventually gave up and retreated, which is why Fort Matanzas was never taken by force. Jill told us all about how life in the fort must have been . It was fortified with only a few soldiers and officers, who rotated through after several weeks of duty. It would probably have been a somewhat boring duty, as they mostly drilled and did the things that were necessary to live and maintain a household. We were allowed to roam freely in and around the Fort for about half an hour. We climbed through a very narrow hole to reach the rooftop. Thats our beautiful Dos Libras lying peacefully at anchor below the Fort. 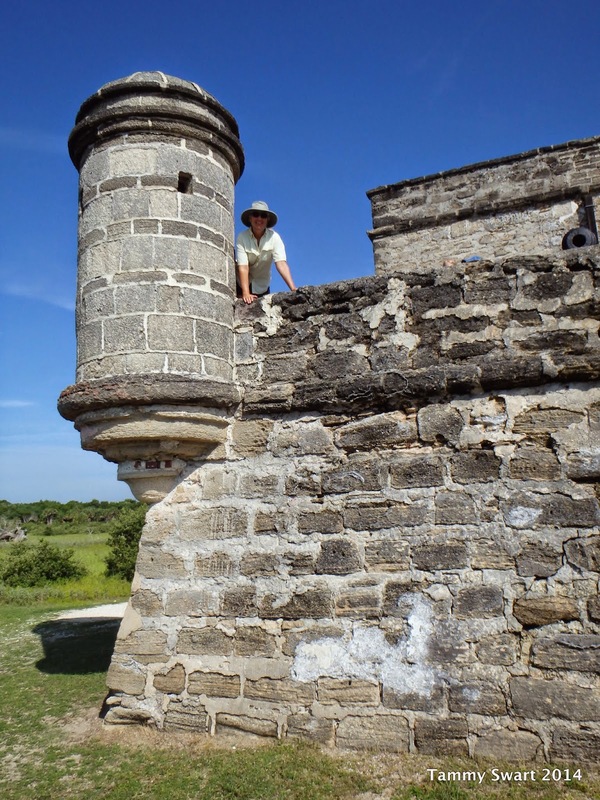 The Fort was built on the banks of the Matanzas river to fortify St. Augustine's "back door" against intruders. As I said before, the Fort was never taken by force, only by treaty or other means did it change hands as the years went by and this land became a part of the United States. We were having such an enjoyable time here in this beautiful anchorage, we decided to stay another day and check out the beaches along the Matanzas. This is a very quiet and serene anchorage on weekdays... but we found ourselves sharing it on the weekend... Luckily we were anchored on the "Slow - minimum wake" line so the small boat traffic was no problem at all, and once again, they all disappeared after about 5pm. Looking for fish in the channel along the shoreline. Any day is a good day when you have a rainbow!